[PDF] Hydrogeological Conceptual Site Models: Data Analysis and Visualization | Free eBooks Download - EBOOKEE! 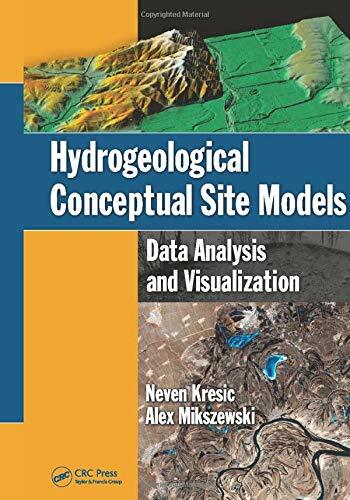 Description: A reference for students, researchers, and environmental professionals, Hydrogeological Conceptual Site Models: Data Analysis and Visualization explains how to develop effective conceptual site models, perform advanced spatial data analysis, and generate informative graphics for applications in hydrogeology and groundwater remediation. Written by expert practitioners, this full-color book illustrates how fundamental hydrogeological concepts are translated into quantitative, high-resolution computer visualizations. In addition, the authors discuss topics not typically covered in conventional textbooks, including GIS technology and the relationship between conceptual site models and environmental policy. Advanced Methods for Data Analysis and Visualization Featuring more than 500 color illustrations, this unique and visually powerful book outlines the required elements of a conceptual site model and provides numerous examples of supporting charts, cross-sections, maps, and 3D graphics. The authors describe advanced analytical methods such as geospatial processing, kriging, and groundwater modeling through practical real-life examples. They also present numerous case studies in groundwater supply and remediation to help explain key engineering design concepts. Data-Driven Assessments of Groundwater Management Policy The authors tackle controversial topics, ranging from technical impracticability of groundwater remediation to sustainable management of groundwater resources. They encourage discussion and independent thought about how current environmental policies and practices can evolve to achieve better outcomes at less cost to society. Practical Strategies for Communicating Your Findings to the General Public While the book is technical in nature, equations and advanced theory are kept to a minimum. The text focuses on practical strategies to help you create easy-to-understand data tables, graphs, maps, and illustrations for technical and nontechnical audiences alike. A companion DVD includes animations, reference material, modeling software, and more. No comments for "[PDF] Hydrogeological Conceptual Site Models: Data Analysis and Visualization".